A mineral is a naturally-occurring, solid, inorganic, crystalline substance having a fairly definite chemical composition and having fairly definite physical properties. At its simplest, a mineral is a naturally-occurring solid chemical. Currently, there are over 4900 named and described minerals - about 200 of them are common and about 20 of them are very common. Mineral classification is based on anion chemistry. Major categories of minerals are: elements, sulfides, oxides, halides, carbonates, sulfates, phosphates, and silicates. The sulfide minerals contain one or more sulfide anions (S-2). The sulfides are usually considered together with the arsenide minerals, the sulfarsenide minerals, and the telluride minerals. Many sulfides are economically significant, as they occur commonly in ores. The metals that combine with S-2 are mainly Fe, Cu, Ni, Ag, etc. Most sulfides have a metallic luster, are moderately soft, and are noticeably heavy for their size. These minerals will not form in the presence of free oxygen. Under an oxygen-rich atmosphere, sulfide minerals tend to chemically weather to various oxide and hydroxide minerals. Chalcopyrite is a copper iron sulfide mineral (CuFeS2). Many pyrite-like minerals exist, such as pyrite, marcasite, arsenopyrite, pyrrhotite, and chalcopyrite. Chalcopyrite has a metallic luster, a deep yellowish-brassy color, a dark gray streak, a hardness of about 3.5 to 4, and no cleavage. Many specimens have a multicolored iridescent tarnish, which can be artificially produced by exposure to certain chemicals (often acid). Chalcopyrite is an important copper ore mineral. The chalcopyrite sample shown above is a variety nicknamed "blister copper", in reference to the closely packed, smooth-surfaced, subspherical masses. 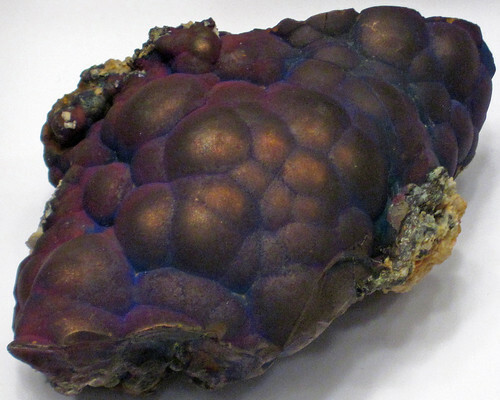 Mineralogically, this is called botryoidal chalcopyrite. Each "blister" consists of numerous outward-radiating, acicular crystals.